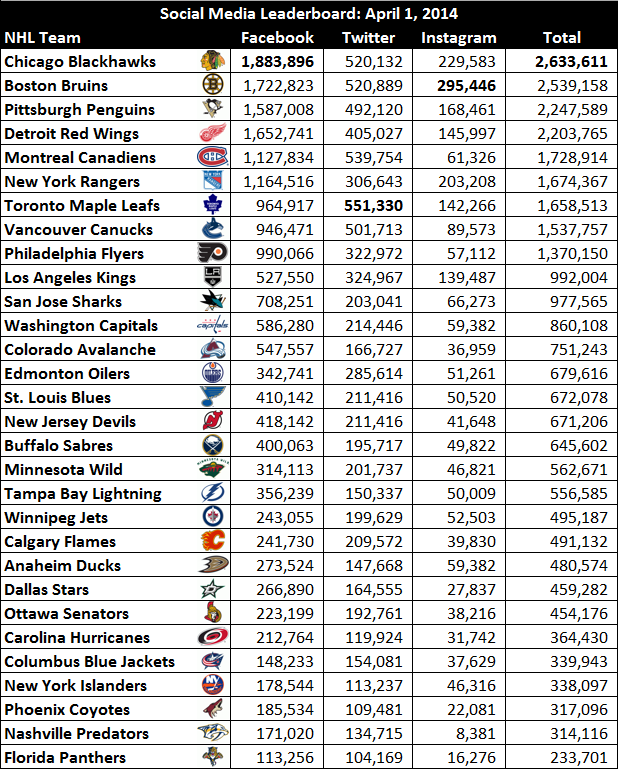 It’s no surprise that the Original Six find themselves within the top seven overall followed franchises, with Pittsburgh, Vancouver, Philadelphia, and Los Angeles rounding out the top 10. The major market franchises are well represented on the top three social media platforms, whereas smaller market teams such as Flordia, Nashville, and Phoenix occupy the basement. Additional platforms such as Vine, Pinterest, and Google+ are not represented because some franchise are either inactive on these platforms or do not have official accounts. St. Louis Blues will move up the leaderboard: the Blues have their best team in a long time and are primed for a long playoff run. The increased exposure on television over the next couple of months should result in more followers. Major market teams will continue to dominate: as it stands right now, the top six franchises are in position to make the playoffs and I fully expect them to continue to increase their respective audiences. Toronto Maple Leafs will be trending on Twitter: whether they make the playoffs or not, the Leafs will dominate social chatter. In the case of not making the playoffs, the content will be much more entertaining. Do any of the results in the social media leaderboard chart surprise you? And which franchises are primed to build a strong following in the coming months?